The California coastline is becoming like a dead zone. If you haven’t been to a California beach lately, you probably don’t know that the rocks are unnaturally CLEAN – there’s hardly any kelp, barnacles, sea urchins, etc. anymore and the tide pools are similarly eerily devoid of crabs, snails and other scurrying signs of life… and especially as compared to 10 – 15 years ago when one was wise to wear tennis shoes on a trip to the beach in order to avoid cutting one’s feet on all the STUFF of life – broken shells, bones, glass, driftwood, etc. With recent news of the Fukushima nuclear fallout leaking radioactive materials directly into the ocean, our lives will never be the same. Radiation from this catastrophe has contaminated and continues to contaminate food crops across the entire northern hemisphere and beyond and can cause all kinds of health issues. It has recently been reported that following the Fukushima disaster, California babies have damaged thyroid glands and another recent study shows that babies born after 2010 have some 26% percent higher risks to have cancer and birth defects. I don’t consider myself an alarmist but don’t bury my head in the sand either. Here are some natural ways we can help to protect ourselves and our children—which are good practices to adopt anyway for optimal health. 1. Reduce your radiation exposure. If you live in an area receiving any radiation exposure, remove your shoes and leave them by the door. Use a HEPA air purifier, filter and vacuum to get rid of any excess dust and change filters regularly. Also, during periods of high airborne radiation releases, you may want to stay out of the rain. Radioactive isotopes are constantly spewed from the Fukushima nuclear plant and are easily picked up by the jet stream and transported across the North Pacific in storm systems. When these weather fronts hit the mainland, the rains wash the radioactive particles out of the air and spreads them over everything that receives precipitation. Following the disaster, Los Angeles rainwater was five times over the normal amount of radiation. 2. Eat clean. Our bodies are already working overtime trying to eliminate toxins so the choices we make can either help the process or make it harder for our systems to perform. Consider reducing (or eliminating altogether) your intake of soda, fried and processed foods, artificial sweeteners and refined sugars. 3. Avoid consuming fish caught off the west coast of North America, Canada and Japan. Marine chemist Ken Buesseler found Pacific cesium levels 50 million times higher than pre-disaster levels. The levels tapered off but plateaued at 10,000 times higher than normal. The algae get contaminated and it goes to the little fish, to the big fish and then to you. It is also wise to avoid dairy and meat. The higher on the food chain, the higher the concentration of radioactive materials may be. Dairy products in particular may be the most contaminated item, because radiation is most concentrated and the living creature has eaten the contaminated grass, other foods and water (from contaminated rain that forms from the Pacific and atmospheric particles) the radiation from which is stored it in its body and passed on to whoever eats it. After the Chernobyl disaster in the eighties, there were numerous cases of children becoming severely ill from drinking cow’s milk. 4. Invest in a good water filter. 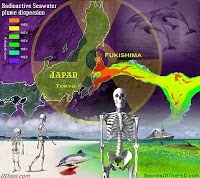 Authorities have been unclear about the level of contamination caused by Fukushima in our water supplies. It may be prudent to have a water filter that not only removes chemical and biological contaminants but also can filter radioactive particles. A filter which includes carbon, reverse osmosis, and ion exchange are the most effective systems available to not only protect you from radioactive particles but also fluoride, heavy metals, pesticides and many other contaminants. Our family uses this under the sink system. 6. In supplement form, citrus and apple pectin have been shown to bind to and remove radioactive materials such as Cesium-137 from the body. Apple pectin is known to draw radiation from the body. Russian doctors have found apple pectin to be among the most effective means for protecting against radiation when consuming contaminated foods is unavoidable. Pectin, along with vitamins and minerals, eliminates radionuclides ingested from foods. 7. Spirulina, chlorophyll and chlorella have all been shown to reduce significantly or even remove radioactive materials in people who were contaminated by the Chernobyl fallout. Additional research found that rats consuming spirulina or chlorella algae eliminated seven times the amount of dioxin when compared to a control diet. However, this blue-green algae superfood should probably not be sourced from the west coast of North America, Canada, Japan or nearby waters. Try adding one or two of these to your water, smoothies or take in pill form daily. 8. Reishi mushrooms have been long used throughout Asian pharmacologies for centuries to increase white blood cells, help fight cancer, tumors, increase longevity, improve liver function and maintain a healthy immune system. The recommended method is slicing the dried mushrooms, simmering for three hours and drinking the concentrated tea. Rhodiola, an adaptogenic herb (responds to your body in nonspecific ways to increase resistance to stress and boost overall strength and vitality without disturbing biological functions), is known for treating cancer, tuberculosis and preventing aging and liver damage. It also helps the body resist physical, chemical and environmental stress. Holy Basil (tulsi) is another aptogen, originally from India and used in Ayurvedic medicine for everything from the common cold to mercury poisoning. Bilberry contains the important nutrients quercetin, anthocyanins and resveratrol which are said to protect against free radical and toxin damage and help to protect against damage from radiation (in a topical form, with the detoxifier glutathione). Antioxidant extracts of the leaves of the Gingko biloba tree may protect cells from radiation damage, according to a study published in the International Journal of Low Radiation. Milk thistle supports the liver in removing toxins and may offer some protection from radiation damage, although more research is needed. Aloe vera can be taken orally and applied topically. It has been known to ease side effects from radiation and is a natural laxative with soothing agents. Herbs high in selenium may protect against DNA damage. These include nettles, burdock root, catnip and ginseng. Cilantro removes heavy metals from the body. Radium bromatum is a specific homeopathic remedy for radiation poisoning. Acute dose is 3 – 5 pellets of 12X to 30C every 1 – 4 hours until symptoms are relieved. 10. Vitamins D3, K2 and E. Most of us are deficient in Vitamin D3, no matter how much sun we get. Mushrooms are an excellent source of vitamin D. Mycologist Paul Stamets discovered that you can naturally multiply their levels of vitamin D by exposing them to sunlight. Vitamin D-enriched mushrooms are best made from June until September and can be dried as the high vitamin D levels generated will last for more than a year. This is especially beneficial for people living in colder climates. However, our bodies don’t always assimilate it. That is where Vitamin K2 comes in. It acts as an assistant to help get Vitamin D3 directly to your bones. When our bodies do not get the calcium or sufficient nutrients it needs, it pulls from another source and the source could be toxic—such as radiation, lead and mercury. When your body is content and assimilating all that it needs through a healthy diet and supplementation then it is less likely to absorb harsh chemicals. Natural sources of Vitamin K2 include fermented veggies, organic nato and curd cheese. Vitamin E is a fat-soluble vitamin with antioxidant properties that plays a huge role in fighting free radicals that can prevent or delay chronic diseases. Vitamin E is found naturally in avocados, nuts, olive oil and sunflower seeds. 11. It is crucial to get enough calcium, potassium, iron and magnesium. Radioactive strontium is very similar chemically to calcium. Our bodies take up strontium and deposit it into our bones, treating it as if it were calcium. If we’re not getting enough calcium, then our calcium-hungry bodies will more quickly and eagerly absorb strontium. This is the same reason that potassium iodide works to protect against damage from radioactive iodine—by loading up on harmless iodine, our bodies are less eager to absorb the dangerous type of iodine. Similarly, radioactive cesium is treated like potassium by our bodies. The body absorbs it, treats it like potassium, and deposits it in our muscles, heart and other tissues. Plutonium is treated like iron by our bodies. So getting enough iron will help reduce absorption of plutonium. Magnesium has also been shown to provide some protection against radiation and is essential for absorption of calcium and potassium, plus it helps protect your heart and other body tissues. 12. Activated charcoal is charcoal that has been treated with oxygen to open up millions of tiny pores between the carbon atoms. The use of special manufacturing techniques results in highly porous charcoals that have very large surface areas and works to trap toxins through “adsorption.” When a material adsorbs something, it attaches to it via chemical attraction. The huge surface area of activated charcoal gives it countless bonding sites for adsorbing toxins. Because charcoal is not “digested” like food, it may remain inside the GI tract for a period of time, thereby continuing to actively remove toxins via the bowel. We use this brand as it is the most pure I could find. Be sure to drink a lot of water with it as it can cause constipation. 13. Bentonite clay absorbs toxins (including pathogenic viruses, herbicides, pesticides, free radicals and radiation) similar to activated charcoal. It has a large and varied mineral content, including over 50 minerals, and been used for ages by many cultures for detoxification. When bentonite clay absorbs water and swells, it stretches open like a highly porous sponge. Toxins are drawn into these spaces and bound through electrical attraction. The bentonite is eventually eliminated from the body with the toxins bound to its extremely minute rectangular particles and surfaces. 14. Start increasing your intake of iodine. The incidence of thyroid cancer was off the charts after the Chernobyl nuclear disaster and as I previously mentioned, there have been recent reports of damaged thyroid glands of California babies after the Fukushima nuclear fallout. Sea vegetables such as dulse, wakame, kombu, and nori seaweeds have been shown to neutralize radioactive isotopes in the body and contain a high amount of protective natural iodine protect the thyroid. Just be sure to avoid seaweed from the west coast of North America, Canada and Japan. You can also put a few drops of pure iodine in your water which will make it more difficult for your thyroid to absorb radiated iodine. 15. Detox/cleanse/exercise/massage. It’s always a good idea to try to cleanse and detox at least four times a year. Sweating it out with exercise and infrared saunas is helpful, as are lymphatic drainage massages. Last, but not least, stay informed. Seek as much information as you can and take control over you and your family’s health and well-being. Kyoto University’s Okada Norio, Yoshio Kajitani, Hirokazu Tatano & Beijing University’s Tao Ye, Peijun Shi: [T]he nuclear accident gradually became a level 7 nuclear event, which is a major accident and the highest level on the International Nuclear and Radiological Event Scale (INES), equivalent to the Chernobyl disaster in April 1986. The radiation in the vicinity of the reactor rose steeply, becoming a deadly threat to the local residents […] three units were exposed to level 7 accidents and one unit was exposed to a level 3 incident. The critical issue in the crisis became the cooling systems failures. […] The high temperature turned most of the internal coolant water into steam, which in turn exposed the fuel rods to air. […] Fuel would escape away from control rods, intensify decay, melt through the reactor floor, and consequently induce a massive release of radioactive isotopes, a worst case scenario. 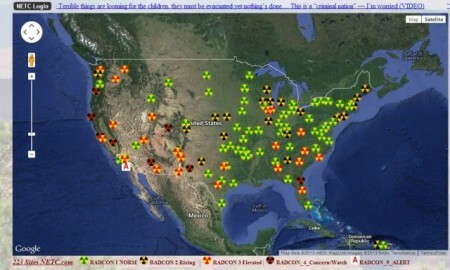 […] Radioactive isotopes released from Fukushima were later detected in North America and other regions in the world. […] The long-term impact of the nuclear crisis to Japan, the Asia-Pacific region, and the entire world is still not fully revealed. 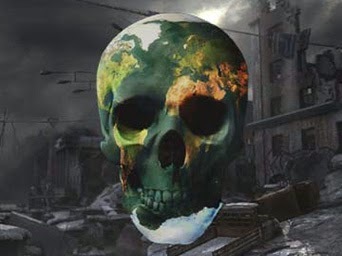 […] The radioactive contamination caused by the nuclear accident following the earthquake and tsunami is affecting the rest of the world through atmospheric circulation. The polluted water released by the Tokyo Electric Power Company is likely to affect the entire Pacific Ocean in the coming decades.